Sailing Tahiti is a panacea for vacationers who have grown to believe that paradise is always marred by development and commercialism that tourism often brings. Whether you take advantage of Tahiti’s line-of-sight sailing on a bareboat catamaran charter or completely relax aboard an affordable, all-inclusive crewed catamaran charter, we offer these suggestions to help you plan a sailing vacation you will never forget. 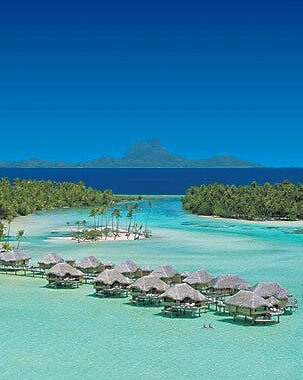 Tahiti is the largest of the Windward Islands in French Polynesia. Midway between South America and Australia, French Polynesia is a collection of 118 islands spread out in the Pacific Ocean over an area about the size of Europe. 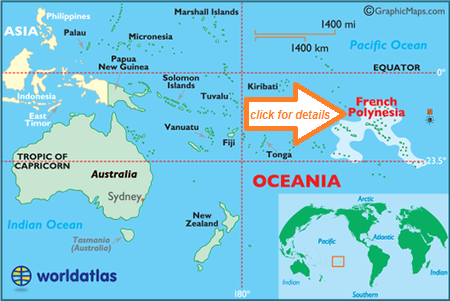 The islands are part of the Austral, Gambier, Marquesas, Tuamotu, and Society archipelagos. Tahiti is home to the French Polynesian capital, Pape’ete. Tahiti is only one gem within the Society Islands, other much-sought-after cruising destinations include Raiatea (our charter base), Bora-Bora, Taha’a, and Huahine. These islands are downwind from Tahiti, thus are known as the Leeward Islands. Verdant craggy mountains rise from the sea appearing to float in its own protected barrier reefs built on the remnants of ancient volcanoes. The reefs comprised of colorful hard and soft coral are home to sea turtles, rays, sharks, dolphins, porpoises, and more than 500 species of fish, many of which never leave the reef as it provides food, habitat, and safety. The variety of sea-life and the colorful fish such as the clown fish, emperor angelfish, yellow moorish idol, parrot-fish, and napoleon fish as well as the spectacular manta rays, sting rays, and eagle rays that glide through the aquamarine waters make the Tahitian Leeward Islands one of the planet’s top snorkeling and SCUBA destinations. Continual easterly trade winds averaging 15-20 knots ensure a Tahiti sailing vacation is relaxing. The reefs assure calm waters while the open water outside the rings offer spirited sailing on passages between islands. 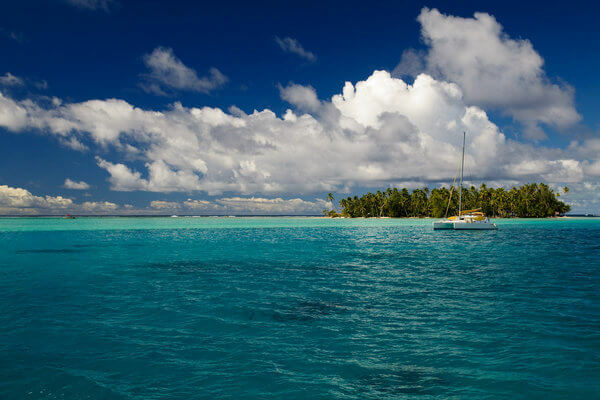 With line-of-sight navigation within the reefs, insignificant tides, and weak currents, sailing Tahiti is perfect for bareboat sailors with basic coastal navigation skills. These exotic islands, people, and sea life keep novice and veteran sailors as well as all-inclusive yacht charterers returning again and again for adventure and regeneration of the soul. Our recommendations center on the Leeward Islands which lie to the west of Tahiti. In French Polynesia, you can have the best of both sailing tourism worlds with modern accommodations as well as remote areas to escape to. After a pleasant day of sailing, awe-inspiring snorkeling, or lounging on a deserted beach in a picturesque lagoon, pick up a mooring to dine ashore at a local restaurant. Or if you are treating yourself to an all-inclusive sailing vacation, your captain can drop anchor in a quiet, secluded hideaway so you can savor your chef’s creations while star-gazing in the southern Pacific sky. Raiatea is our yacht charter base. The island is a 40-minute flight from Pape’ete. The town of Uturoa provides services to help you provision your bareboat charter yacht. We are happy to assist with advice on what to buy and where to get it. Or, better yet, book an all-inclusive crewed charter and forget all those worries. In addition to spectacular vistas above water, there are 20 dive sites between Raiaitea and Taha’a virtually minutes apart. A must-do is a wreck dive of a three-masted ship called the Nordby that sunk in 1900. There is something for every SCUBA diver level and preference. Depending on your skills, enjoy drift dives through one of the 11 passes, explore drop offs and pinnacles, or for more the more advanced, venture through caves and coral canyons. The calm reef waters are teeming with a large variety of colorful fish and are absent of threatening sea-life so they present many opportunities for snorkeling. Raiatea, according to legend, is the sacred home of the gods.1000 years ago, it was the first island to be settled making it the historic and cultural center of Polynesia. Ashore, you can visit the ancient sacred sites and explore the river where the legendary great canoes were built for voyages to Hawai’i and Aotearoa (Maori name for New Zealand). While it is difficult to fathom why Raiatea natives would choose to migrate from this Utopian island, it is even more challenging to imagine setting off for these far-off places in canoes having faith in their abilities to navigate to new shores. Don’t miss the south side of the island where breathtaking waterfalls tumble into the sea from the towering remains if a volcano. After enjoying the sheltered lagoon shared by the twin islands of Raiatea and Taha’a, plan to set sail to neighboring islands. Raiatea is within sight-sailing distance of islands, Bora Bora and Huahine, about 24 miles eastward/winward to Huahine and 22 miles northwest/downwind to Bora Bora. Taha’a is only accessible by boat and is easily circumnavigated with the encircling lagoon’s wide channels, calm waters, and steady winds. Taha’a is the most underrated Pacific islands, especially for sailing. It makes a top destination with its many sheltered coves with good anchorages, the unparalleled scenery as good as it gets in the Pacific, abundance of excellent snorkeling and SCUBA sites, and variety on-shore activities. Mostly untouched by development, tantalizing scents of plumeria and vanilla (from the curing pods on vanilla plantations) waft over the lush vegetation. If you can bear to leave lovely sight of Taha’a from its surrounding turquoise waters, you can explore its charm and local hospitality along the 50-mile coral road that skirts its edges. You will find a lot to do on this tiny island such as visiting a pearl farm or discovering the source of the vanilla fragrance. Or just continue communing with nature at sea with a dinghy visit to the reef’s shallows to explore under the sea or among the palm-clad beaches of the many islets that ring the lagoon. As you make an invigorating windward passage to Huahine, drop a hook hoping for a dolphinfish, barracuda, or, if you are lucky, a tuna. If you are bareboating, the village of Fare is a great place to anchor to fill in holes in your provisions. To begin enjoying all this island has to offer, anchor south to enjoy the beach and snorkeling. You’ll find nature unbound with dense vegetation, unspoiled beaches, coral reefs teeming with life, and “motus” (islets) reminiscent of the Garden of Eden. If you want to explore more of Huahine’s mystical past and present, jump aboard a 3.5 hour circumnavigation of Huahine Iti. Dwellings, temples, and the ancient lake of wizards will transport you back to the beginning of this island’s 1000 year history. One of the better known islands due to the multitude of movies made here, there is still a lot of unspoiled nature to be found. Especially aboard a yacht charter where you can reach secluded anchorages and places accessible only by boat. Sail to the eastern side to visit the Lagoonarium where the “natural aquarium”, privately owned, offers an enticing lagoon with the opportunity to swim with rays, turtles, sharks and myriads of colorful fish with a guide. There are plenty on-shore activities in Bora Bora. You can dine at the family-friendly Bora Bora Yacht Club or trek the island road on a bicycle, scooter, or in a car. On a Tahiti yacht charter, your sailing plan is yours alone to determine and to change as you wish. Bareboat charterers enjoy the relatively easy navigation While all-inclusive crewed charterers get 5-star treatment in paradise. Plus, when you have a crew at your disposal, you get all the insider information for the best snorkel and dive spots, the most amazing anchorages, and when to best enjoy onshore activities.